These steps are for the students of the Degree Campus of the Islamic Online University. How do I check my total 'Course Grades'? Log into the degree campus site. Click on the “ Courses” tab on top of the campus to view all of your enrolled courses of the semester. Thereafter, you will see the course grades besides the name of each course. 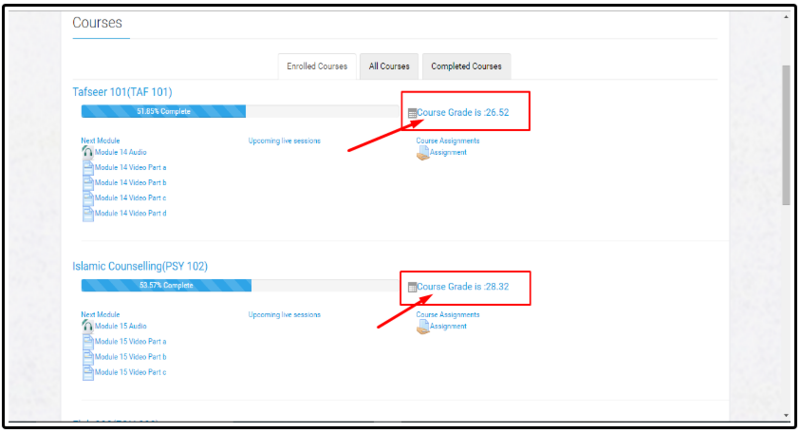 Click on the individual course grade for a detailed grade sheet of the course. Note: Even though you can view your grades right after you attempt the tests and exams, the grade history is updated only 1-2 weeks after the announcement of the final results.